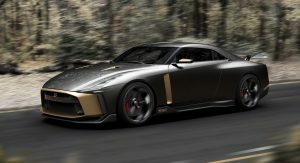 The new Nissan GTR-50 by Italdesign made its world debut at the Goodwood Festival of Speed, giving us the first proper look at its sharp bodywork styling. 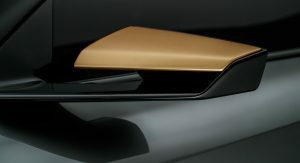 The concept is a collaboration between Nissan and Italdesign for the 50th anniversary of both companies. 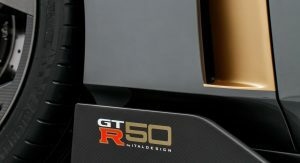 Depending on feedback, the GTR-50 could enter a very limited production run of no more than 50 units, priced at around 900,000 euros (a little over $1 million) each. 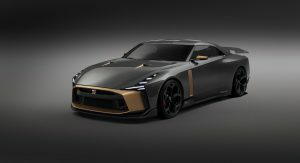 The car is based on the latest GT-R Nismo but it features a completely new bodywork and interior design, penned by Italdesign. 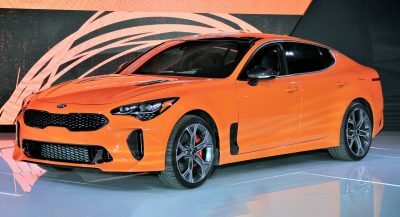 Highlights include the thinner headlights, a lower roofline, a steeper rake for the rear window and the twin-floating taillights with hollow centers. The two-tone paintjob combines Liquid Kinetic Gray with Energetic Sigma Gold accents. 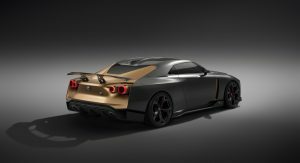 The interior gets a new dashboard and features two different carbon fiber finishes, as well as matching gold detailing and a pair of carbon-shelled bucket seats. 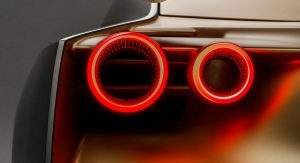 The reworked twin-turbo 3.8-liter V6 engine produces 710hp (720PS) at 7100rpm and 575lb-ft (780Nm) between 3600 and 5600rpm, thanks to the addition of larger turbos from the GT3 race car and heavy-duty internals. 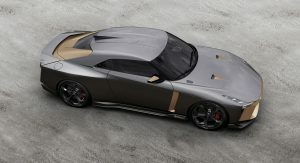 “The Goodwood Festival of Speed is the ideal setting to showcase the Nissan GT-R50 by Italdesign, which combines power and artistry to celebrate 50 years of inspiring the dreams of our customers,” said Alfonso Albaisa, Nissan’s senior vice president of global design. “Just like the prototype itself, Goodwood is a celebration of design, performance, a little indulgence and a lot of love of historic and future automotive creativity. 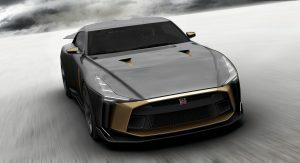 It’s the perfect setting to showcase a unique vehicle that will stir the imagination of people to dream even bigger,” he added. I knew this would happen. 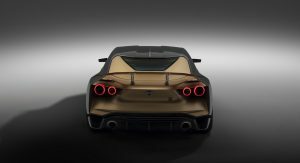 All the press photos were dark for a reason, and the reason was to minimize how alienating the rear end is. 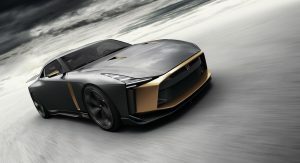 The front is exquisite; led headlamps, very nice grille surround, totally looks like a more modern GT-R. The rear looks unfinished, poorly executed, awful protruding round taillights, and a tacky spoiler. It’s like 2 different cars. 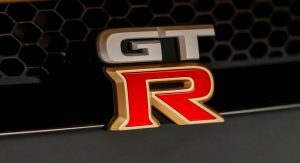 I agree, the front says GTR; no question. 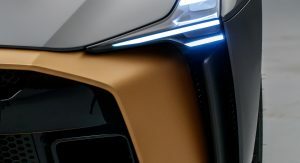 The back, I can only assume came from some other concept Italdesign had in a back room somewhere. It just doesn’t fit with anything else on the car, and the rear fenders are almost fins from the 1950’s. My guy! And I totally agree! 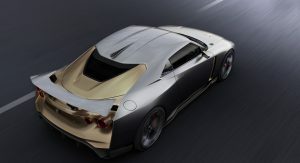 Replace everything gold with carbon fiber. I say replace it with polished and treated aluminum or stainless steel, Or “Grand Piano” gloss black. Some guy was just flying around in a jetpack at the FOS. Where’s my jetpack? I want one. Man the rear on that thing is ugly. 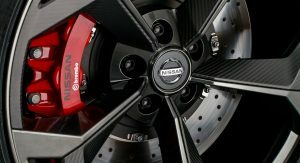 Nissan should have just called this the “new” GT-R and charged $130,000 for it. It would have sold well. 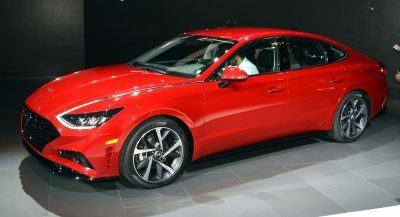 Agree.. it’s nice but no where near $1million nice. They ask 1 million dollars for this piece of crap? 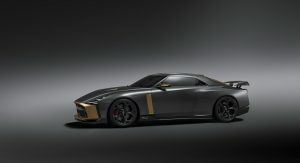 I am really looking forward to the R36 if it takes cues from this. Absolutely hideous. 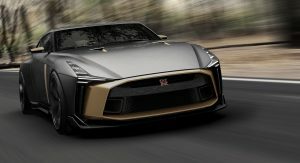 What a disgrace to the GT-R legacy. Whoever okayed that design must be half blind. Nothing flows, ugly proportions, big mouth like a fish, gross colors. Terrible. You know, this might be the first time I agree with you, this car is absolutely hideous. And to top it all off, it will cost around 1 million. I read some comments and I say “wtf”? 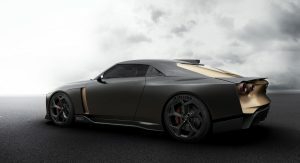 This Car looks so amazing include the back side! After I watch the Video I was totally agreed with the people. This looks so very ugly! The proportions of all doesn’t fit together. Big and wide Front, but the side are to thin and the back as well. I think the problem people have with this car can be narrowed down to a few things. Disproportion & Color Choices. #1. The rear wing is up. If the rear wing was down, it would flow a lot better as shown in the original photographs/renders. 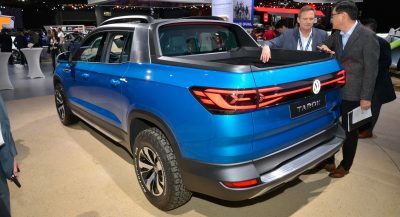 (so I think we’re just seeing it from some not so great angles) It looks disproportioned because the rear sloped down especially at the very back in a “not so pleasant” way. But When the rear wing is down the proportions align to how they should be (and it looks like a proper GT-R), when it’s up… not so much. #2. 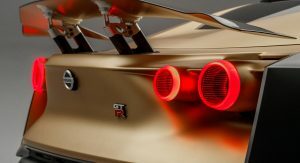 It’s based on the current GT-R (not the next one) and the back/trunk area is a little long for modern tastes, especially with the 2020 Vision Gran Turismo Concept inspired design. #3. Not so great color choices. I don’t actually mind the colors that much, but I am sure they could have picked some much better ones to show off (if anything maybe some other variations of the vehicle). These small, mildly minute details are really just visual. The vehicle itself (if you don’t mind the large grille) it quite beautiful. It’s just the way they chose to display the design, was done poorly, giving it the false appearance of it being disproportioned.